From the Percussive Arts Society International Convention in Indianapolis to the WGI Sport of the Arts Percussion Championships in Dayton, DCI.org columnist Michael Boo has been making the rounds at recent music events with his eyes peeled for new and innovative percussion products. From the totally practical "Why on Earth hasn't anyone thought of this before?" 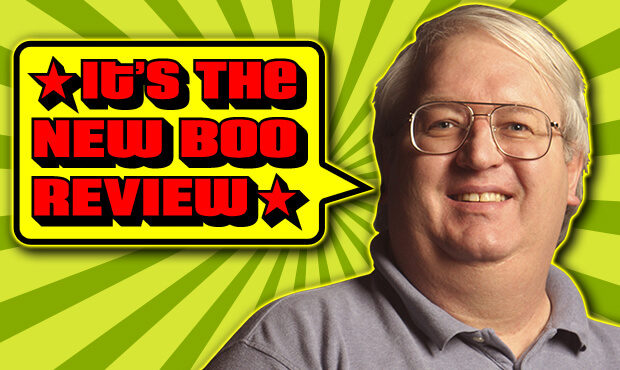 to the more offbeat, Boo sings the praises of his favorite finds, assigning his own special awards to standout products he's seen showcased in convention centers across the country. Quite frankly, after field-testing these miraculous earplugs since December, I'm going to proclaim that EVERY percussionist should own a pair. What's remarkable about these little wonders is that they don't change the quality of sound one bit, but they instantly react to spikes in volume over 118db and will immediately lower that sound at least 25db, reducing and even preventing hearing damage. That will occur, for example, during a loud rim shot or nearby cymbal crash in a corps rehearsal. As soon as the noise event is over, the hearing electronically returns to normal. Percussionists wearing these wouldn't even be aware such a volume spike happened, except for knowing their ears aren't throbbing in pain. At either the 9 or 15db settings, incoming sound seems perfectly normal. 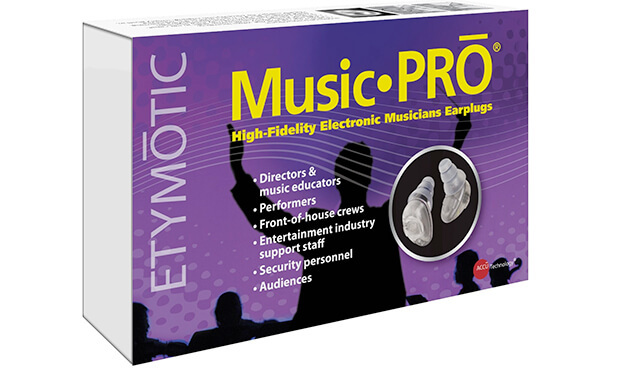 The device comes with several different sizes and styles of earplugs and a package of earplug batteries. Some may think the $299 cost is a little pricy. But an important question must be asked: What is your hearing worth? Witnessing this incredible contraption live, I was struck with a recurring thought: Why hasn't someone come up with this before? Changing drumheads is an annoying reality of being a drummer. Changing a lot of drumheads at once is a time-consuming hassle. 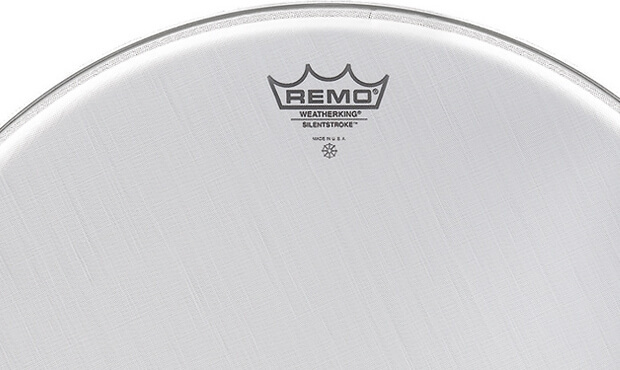 This clear reinforced polycarbonate disc works on all drumheads from 8" to 16" and standard lug patterns from four to 10 lugs (though currently not with six-lug 14" and 16" configurations). Just slap the bottom of the tuning keys over the lugs, place the top of the tuning keys into the proper ring of color-coded holes, and crank away. The head pops right off. Put on the new head, reverse the process, and after a few cranks, the head is ready for fine tuning, accomplished by removing the disc and turning the individual tuning keys. After folding the handle, everything slips into a bag. 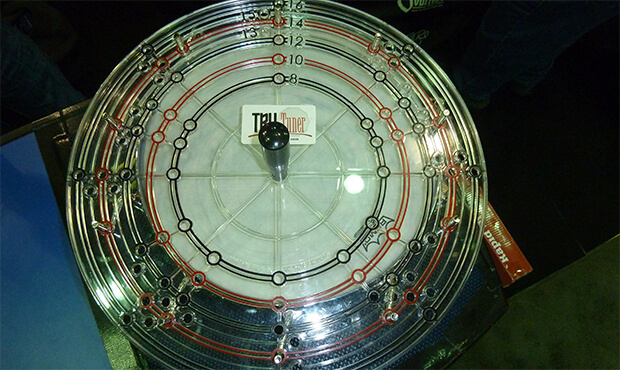 The TruTuner makes drumhead drudgery fun and provides for an exact head tuning every time. It also is fun for others to watch. When's the last time watching someone changing heads was cool? A drum line can now change its look every season with minimal investment, making older-but-viable drums look new. This is a budget godsend. 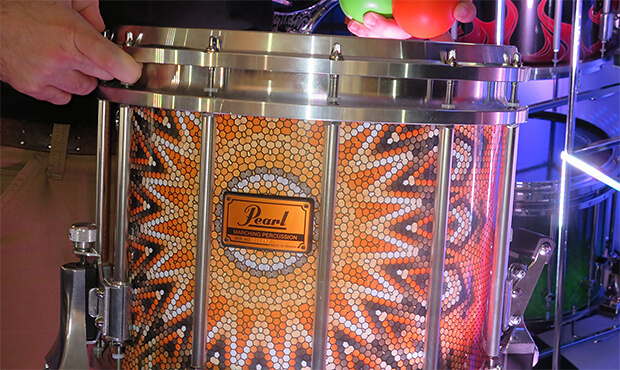 These drum slips are available for Pearl, Yamaha. Mapex, Dynasty, and Tama snare, tenor and bass drums. The pre-cut lugholes allow for the slips to fit right on to existing drum shells. One doesn't even need to remove the lugs, and wrapping one shell takes about as long as changing a single head. There is no sticky adhesive. There is a large selection of existing designs and colors. Custom drum slips are available at a relatively modest extra cost. This product is a brilliant idea and will stretch budgets immeasurably. If you don't tell every band director and drum instructor you know about it … Well, just tell every band director and drum instructor you know about it. Their wallets will thank you. 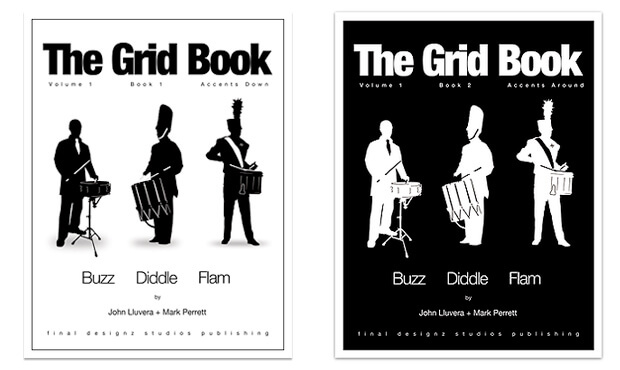 Final Designz Studios has come out with perhaps the definitive books for stick control that will make the hearts of drummers flutter in perfect unison. These books delve into "gridding," the interplay between a constant (such as a recurring accent) and a variable (such as a flam). The exercises move the variables around in a way that continually keeps a drummer's mind sharp, helping prepare her/him for the marching field or a life in nuclear quantum mechanics. This is a superb method of developing rhythmic accuracy, sight-reading and chops building. Book 1 will develop control of rudiments and awareness of accent placement, while Book 2 explores more complex accent placement in a seemingly endless variety of rudimental combinations. At some 700 pages per book, drummers can work through these epic volumes from now until the sun explodes or until their wrists fall off … whichever comes first. Put this on your drum(s) at home and you won't hear your parents yell for you to stop playing five seconds after you start. Drummers love to make noise. The rest of the known universe hates it when drummers make noise. The creator of these heads should be nominated for a Nobel Peace Prize. The heads allow drummers to practice normally while producing an extremely low volume, yet still enjoy the feel of a normal drumhead tap and rebound. Your family, your neighbors, your dogs, your neighbors' dogs and people walking down the street in front of your house will thank you. Pretend you're a drummer biking in the Tour de France or playing on the dashboard of a Formula 1 race car with these carbon fiber drumsticks. Percussionists have had Kevlar drumheads built for durability for some time, and now they've got a drumstick that is even more long lasting. These sticks are made from an advanced aerospace-grade carbon fiber composite with none of the peculiarities and uneven qualities of wood; yet they still feel the same as wood sticks and provide the same sound quality. There is no need to match each stick to another because every stick is identical in every way imaginable. 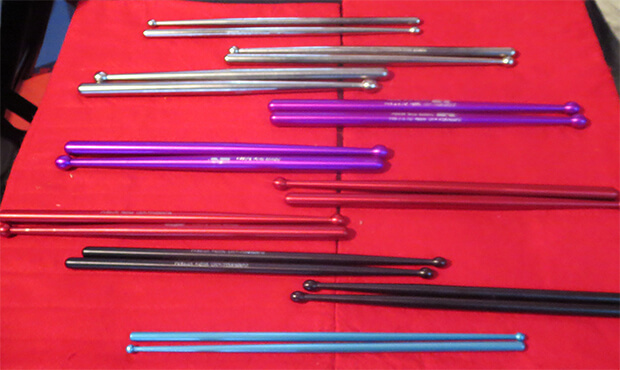 Currently, the sticks are only available in size 5B, making them ideal for high intensity drum set use. However, it's only a matter of time before new sizes find their way into the eager hands of marching drummers. The extreme durability makes up for the expense. You'll likely need to replace your car's transmission before you'll need to replace these sticks. These steel drumsticks will turn your wimpy wrists into solid wrists of incalculable power, able to withstand hours of rudimentary warm-ups and capable of single-handedly knocking out roving bands of unsuspecting criminals. These practice sticks are made of a high-quality steel and come in three weights that are six, nine and 12 times the weight of a normal two-ounce wooden stick. The daily use of these sticks in a drumming practice routine will build up one's wrists and work toward eliminating the pain that comes from long drum line warm-up sessions. 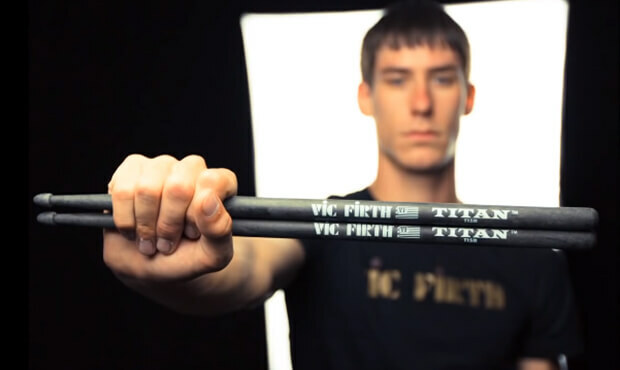 Practicing with these sticks will, over time, provide a drummer with wrist muscles sure to impress those who are impressed by such things. Power Wrist Builders are the Charles Atlas of drumsticks. These are sticks to be reckoned with. Do not taunt these sticks. The third generation of the Roland Handsonic takes electronic hand percussion to and beyond the next level. 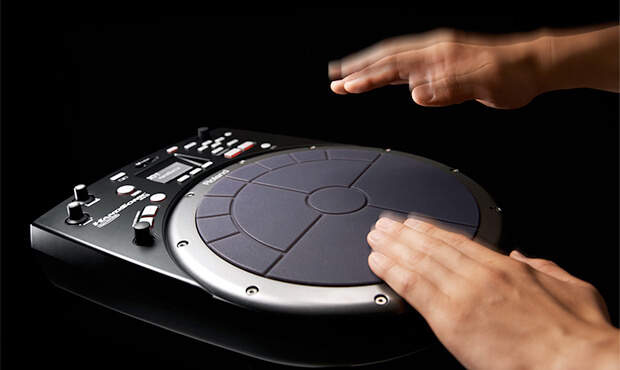 The HPD-20 is a spectacularly versatile electronic drum machine for hand percussionists. Out of the box, it replicates a truck full of hand percussion instruments with 850 different built-in sounds. In addition, it's got 500 locations for user sounds and minutes of mono sampling time. The machine can be programmed to create phrases and sounds and export those sounds as digital audio files. It can also import files and use them as single hits or loop them in real-time performance. The Roland Handsonic HPD-20 is a substantial step up for hand percussionists to use hand drum specific input/output without needing additional devices such as loop pedals, iPods, mp3 players and computers. In addition, one can hook it up to a wireless transmitter (with the optional battery pack) and march with it around the football field, in parades and around the block just to make a scene. All your beats are belong to us. You will be assimilated. As an accomplished composer and percussionist, Boo holds a bachelor's degree in music education and a master's degree in music theory and composition. He resides in Chesterton, Ind.